We all have ideas, no matter how big or small, for making our own streets, neighbourhoods, and districts better places. These ideas have the potential to make the city we live in unique, distinct and vibrant. But how do we unlock this potential? As practitioners we have many tools at our disposal. But which ones do we use? If we’re aiming for an innovative and creative city, we need to treat like with like and engage with it in a creative and innovative way. This is the philosophy behind Idea Bombing, a new way to engage that focuses on experience and community. 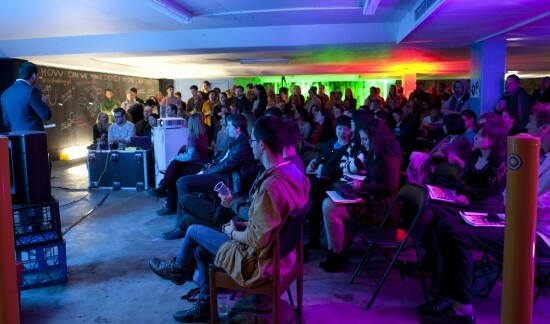 Idea Bombing combines the best elements of a meet-up or talk series with a popup bar. It activates unconventional spaces in the city and highlights potential in rethinking our urban landscape. In many ways, it’s an engagement method in disguise. It is not promoted as ‘engagement’, the word ‘engagement’ is not mentioned, and the usual text book on how to ‘engage’ is left at the event door. What’s important here is the human element of engagement. 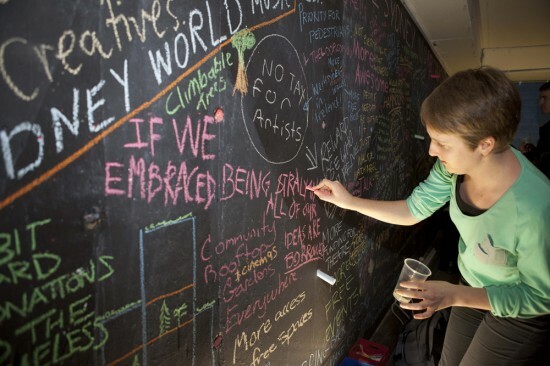 Idea Bombing is interested in what people enjoy doing and leverages off this to capture ideas for improving the city. Idea Bombing starts with a series of ‘power’ talks that are similar to Pecha Kucha in style and 5min in length. These talks are presented by emerging talent and inform, inspire and encourage participants to engage with the event theme. Participants are later asked to ‘bomb’ their ideas based on the theme on the ‘Ideas Wall’. Hence the name, Idea Bombing. The Ideas Wall, which is reinvented at each event depending upon the space and theme, is used to capture all the ideas and also provides an opportunity for participants to interact and share thoughts as a collective. In this way, Idea Bombing becomes much more than an engagement method, it also starts to build community by connecting people and ideas. It’s an exciting time for engagement. Gone are the days where talking with the community is solely undertaken at the City Hall. We are in a new age of engagement, one that is experiencing a renaissance as the next generation of practitioners makes its mark, and one that is enjoyable for both practitioner and participant. Since its launch in 2013, there have been four events held in Sydney, Australia and one event held in Fenelon Falls, Ontario. In 2014 the Idea Bombing family looks to be growing with more events planned in Australia, Canada and America. For more information search ‘Idea Bombing’ in google or visit the Idea Bombing Sydney Facebook page. 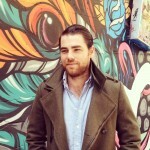 John O’Callaghan is an urban planner, specialising in social activation, community engagement and new media. He is passionate about positive behaviour change and making our cities more liveable through innovation and creativity. John is also the founder of Trending City, a collaborative blogging platform capturing great ideas from across the globe, and is co-founder of Idea Bombing Sydney (Australia), a creative meet-up focussed on turning ideas into action.